Get me to a therapist! I have had an epiphany! While rummaging through a box of old photos, I came across a frightening little gem, which I am certain is the reason for my irrational fear of clowns. It’s simple, it’s cunning and it’s scary. Reader, be warned, what I’m about to show you is not for the faint of heart. Small children should leave th e room, lest they be scarred for life like me. The year is 1961. My sixth birthday and my mother throws a party for me. Among the invitees is Anita, my dear, childhood friend—or so I thought. She is also my next door neighbor. Anita brings me a gift (long since forgotten) and a birthday card that is sure to make any child’s hair stand on end. Not just any card, mind you, but a Hallmark card. You know the one that has the slogan, “When you care enough to send the very best.” Well, very best, indeed, if your goal is to terrify the birthday girl. I am sure that this card was the beginning of the end for me. No doubt leading me down a path that was anti anything clowns. No longer would I be able to laugh at a Volkswagen Bug overstuffed with clowns. Clowns slipping on banana peels would henceforth be lost on me. Ditto for Red Skelton’s clown persona. And getting anywhere within a five-mile radius of a circus would be simply out of the question, thanks to Hallmark and my so-called friend, Anita. I am not one to mince words so here it is, this clown menace must stop once and for all! Wake up, America and cease subjecting your children to clowns. These creatures are neither entertaining nor enlightening. 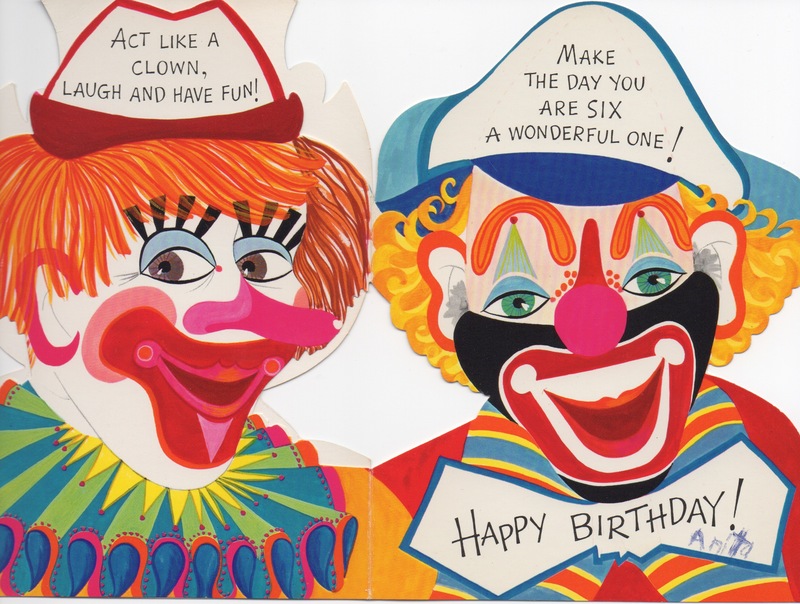 And, contrary to the sentiment on this particular birthday card, I refuse to “act like a clown, laugh and have fun!” I will not send in the clowns and I will not fall for their mind games and become one of them. Learn from the mistake of my friend, Anita. Unbeknownst to her, she became an innocent pawn in a world that prizes clowns as good, safe fun. Clowns are good for one thing only, to torment and scare the living daylights out of small kids. I am living proof and if I ever see Anita again, I will let her know. In the meantime, know this: I long ago put clowns on notice, but after coming across this nightmare of a birthday card, I know that just putting these red-nosed harlequins on notice is not enough! As such, clowns are now dead to me. The buck stops here, my friends. So, find another victim to menace. I’m through with clowns! Sarah, during freshman orientation. Clearly, she had no qualms about leaving me behind, in my empty nest. Turns out, I’m pretty good at partitioning off my life. Sarah’s gone? Well, I’ll just close my Sarah box and put it on a shelf until she returns for winter break. Now that I’ve tucked away her box, the Work box just got a little bigger. Oh, and now there’s more room for my Blog box too! Josh coming down this weekend to see a San Diego Charger‘s game with me? Better dust off his box and get it ready. By keeping myself organized in this way, I can focus on the here and now. Kind of like when Scarlett O’Hara didn’t want to bother thinking about what wasn’t right in front of her and said, “Fiddle-dee-dee! I’ll just think about it tomorrow at Tara.” Trust me, by concentrating on what is in front of me, and not pining for what is beyond my control (Sarah off at school and not here), I can find fulfillment in the present and in what I’m doing now. 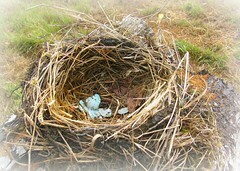 Empty nest, indeed! Of course, I first started to brace myself for the empty nest syndrome when my first child, Josh was a mere six months old. He had awoken in the middle of the night, crying to be fed. While I rocked him back to sleep, this sweet bundle of a boy, it suddenly hit me: My son would be wanting to move out soon. So basically, the only reason Josh woke up that night—and every other night until he was three—was because he wanted nourishment so he could grow into a healthy and strong young man and be fully prepared to leave me. His big goodbye. His swan song. Adios, amigo, it’s been swell! Later, gator! And sure enough, like clockwork, 18 years came and went and all I have now are the memories of my little boy. Empty nest, indeed. Don’t say I didn’t warn you! Thankfully, I have my partitioned boxes. A box for Josh, and one for Sarah. Another for friends, for work, for my dog, and for my extracurricular activities. There’s even a box for shopping. These are the boxes I’m using now. They are the sum parts of my life and I switch them out, depending on the moment. For these boxes keep me sane and keep me motivated. Most of all, they keep me happy.